If there is one mainstream artist who can get me in the mindset of a passionate (or pseudo-passionate) teenager set against the epic (or pseudo-epic) proportions of magic and romance and the paranormal, the hot one–for a spell anyway–seems to be Florence and the Machine. Clearly the film industry has picked up on it when it comes to films catering to teen fans of the paranormal and dark fantasy genres: her song “Heavy in Your Arms” was featured on the soundtrack for Twilight: Eclipse, the haunting and operatic “Breath of Life” was the end credit song for Snow White and the Huntsman, and the trailer for Beautiful Creatures featured the very dark “Seven Devils”. Meanwhile, mash-up after mash-up has been done on YouTube with all of these songs, especially “Breath of Life” and “Seven Devils” where people cut together clips from movies like Harry Potter, The Hunger Games, and Twilight (the Beautiful Creatures ones are emerging) and match these songs to the clips. I’ve gotten several of her songs and put them on various mixes to inspire my own writing, because there’s just something in her style and her lyrics that taps into that part of my brain that unleashes beautiful images, fantastic worlds, and lovers caught in the throes of love’s powerful tide. And all of that. 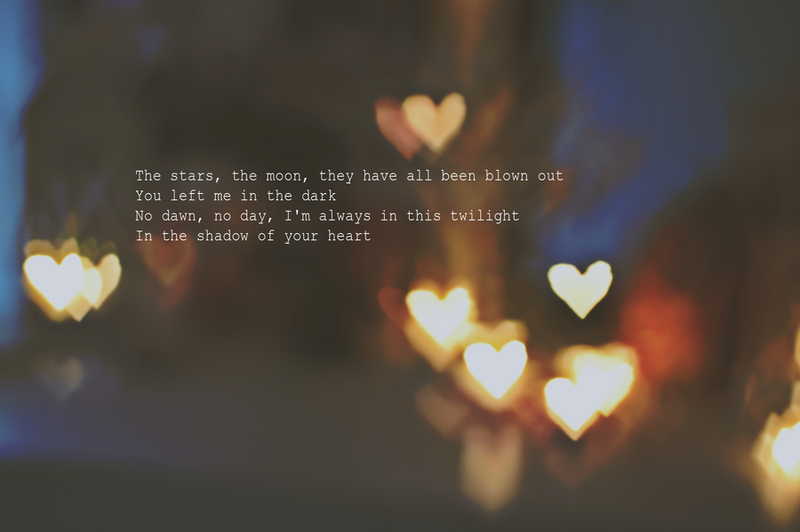 I mean, just consider these lyrics below from her song “Cosmic Love” as illustrated above by a user on deviantart. There’s something there, and filmmakers see it too, an excellent backdrop for any epic romance of myth and magic–as well as packaged and marketed to teens. I don’t believe I heard it anywhere in the one time I saw the Mortal Instruments trailer, but I could be wrong. Either way, even if that string of YA-marketed movie trailers featuring music by Florence Welch and her posse is over, I can see why it happened more than once, in succession. 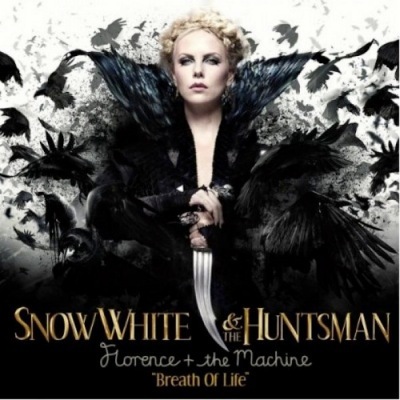 Maybe it was coincidence (I’m not familiar with how far in advance storyboarding for movie trailers are done), but I think someone in the business heard “Heavy In Your Arms” on Twilight: Eclipse‘s soundtrack and thought her music would sound good for the end credits for Snow White and the Huntsman, and then someone saw those credits and heard “Breath of Life”, recorded by Florence and the Machine for the film, and thought, “I need her sound for the Beautiful Creatures trailer!” and went poking around in her material until he/she found “Seven Devils” and thought it would work perfect. And meanwhile on YouTube loads of users were cutting together music videos comprising of clips from Harry Potter, Twilight, The Hunger Games, just to name a few, and setting them to Florence and the Machine’s awesome music–not just to the songs listed above, but also gems like, “Shake It Out”, “Spectrum”, “Bedroom Hymns”, and “Howl”. In any case, it’s another testament to the cycle of creativity, how one art form can inspire the imagination for producing another, and so forth. When I want to get in that particular mood of strange universes ruled by magic and languorous passions, I pop Florence into my CD drive on the way to the work, or while I’m out driving, and those images curl up before my eyes like tendrils of smoke, and I can discover anything, from a new story idea, to a new plot device within a story I’m already working on, to solving a problem (whatever that might be) in said work. And I think with these songs, you get a sense not only of a little epicness and a little romance, but you get something edgy and rebellious–and what self-respecting teenager doesn’t love that, whether in doses big or small. As the title suggests, songs like “Breath of Life” breathe life into my imaginative organ for writing for teens. It’s filled with the elements of YA fiction that those readers who devour the fantastic, sci-fi, and paranormal genres crave–romance, danger, and darkness, all tied together with the haunting beauty of Florence’s voice and lyrics. Even though what I’ve heard of late is that right now a lot of publishers and agents are in the market for more contemporary fiction in their YA prospects (guess they’re getting sick of all the vampires and witches and fairies and all of that), you wouldn’t know that by looking at some bookstores’ YA sections and the number of paranormal romance and fantasy and sci-fi novels shelved there. With Florence and the Machine, I feel not only inspired, but my heart feels freed to write what I wish, and get excited about every word I set to paper (whether digitally or with pen). And the artistry carries into the album covers. 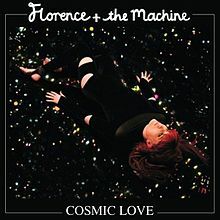 Like the one for the “Cosmic Love” single here. Whose music puts you in the right mindset for what you write?